At a press conference in Brussels on Wednesday, the European Council president insisted there could be no renegotiating British Prime Minister Theresa May’s deeply unpopular withdrawal agreement. 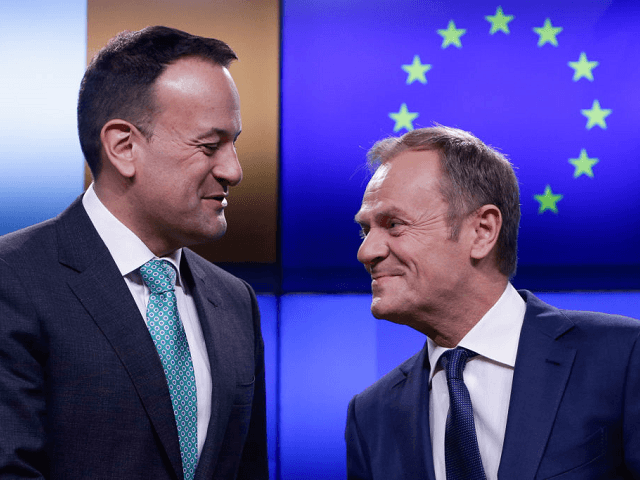 Appearing alongside globalist Irish premier Leo Varadkar, Tusk said the EU was preparing for the “possible fiasco” of a clean Brexit, asserting that the bloc’s insistence on the so-called backstop was a matter of not wanting to “gamble with peace” on the continent. “I have been wondering what a special place in hell looks like for those who promoted Brexit without even a sketch of plan how to carry it safely,” said the former prime minister of Poland, before posting his own comment to social media. Tusk’s apparently pre-planned remarks, which were tweeted from his account on the social media website as he spoke the words at the press conference, failed to impress Brexit-supporting politicians in Britain, where the message provoked some ire. Both men laughed as Tusk appeared to respond: “yes, I know”. The Brexiteer representative for Antrim in Northern Ireland, Sammy Wilson MP, blasted the European Council chief for his comments as a devilish, trident-wielding, euro maniac who was “doing his best to keep the United Kingdom bound by the chains of EU bureaucracy and control”. Wilson spoke to Breitbart London after Tusk’s hell comments and pointed out that not even his native Poland wanted him to be European Council President and voted against his election. The rising Brexiteer said: “The arrogance of the President of the European Council is astonishing. Tusk and his cabal hold the British public in contempt and cannot contain their disdain for the expressed will of the Kingdom. “We should not be surprised. After all, this is a man who has a track record of ignoring the wishes of member states. Whether it’s the UK’s decision to break free from EU control or his own nation’s opposition to his re-election as President”. Breitbart London previously reported on an anti-populist speech given by the Europhile figure in Poland in November, where he called on an audience of what German state media said consisted of ‘intellectuals and politicians’ to overthrow the country’s popular conservative government.